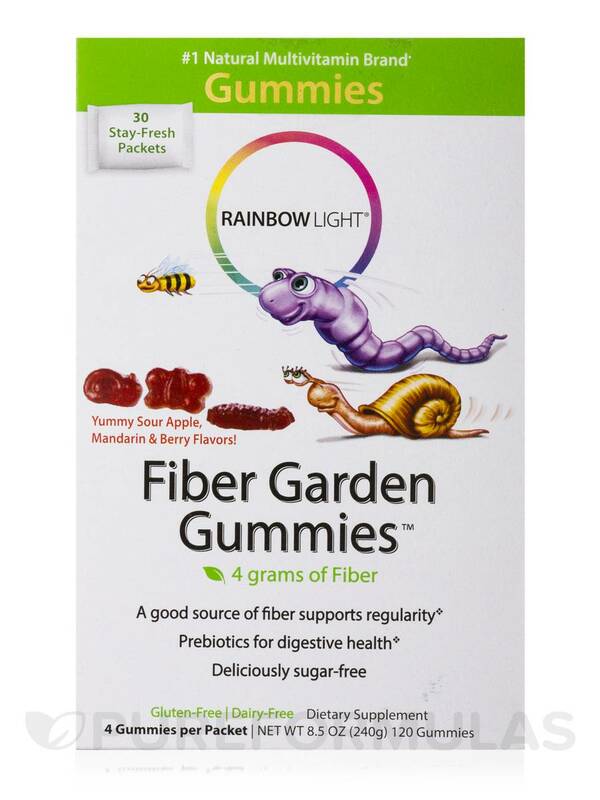 I was hopeful that my daughter would like these Fiber Garden Gummies™ (Assorted Flavors) by Rainbow Light but she doesn't. I can sometimes convince her to take them but not often. I think they are not sweet enough for her. Getting kids to eat their fiber was never easier - or more delicious! 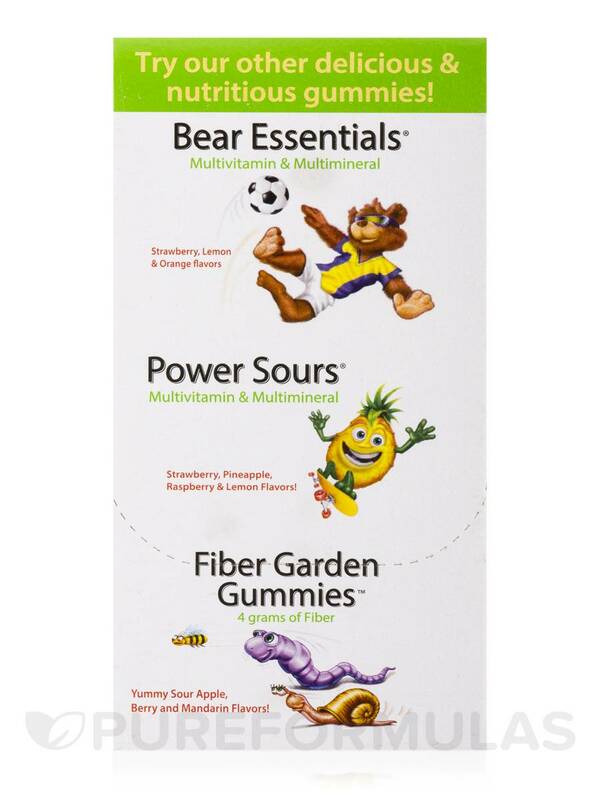 Yummy‚ sour fruit Fiber Garden Gummies™ are sugar- and gluten-free and provide 4 g of fiber plus the ORAC (antioxidant) equivalent to 2 servings of fruits and vegetables. 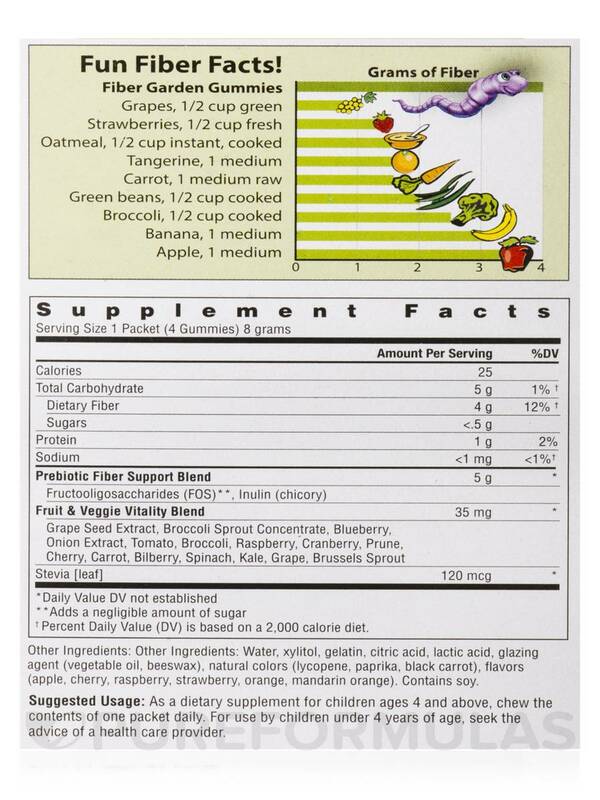 Digestion enhanced with NutraFlora (FOS)‚ a prebiotic fiber that supports immunity and digestion. Xylitol is also included to support oral health. Single-serve packets preserve freshness and purity and are perfect for nutrition on the go. 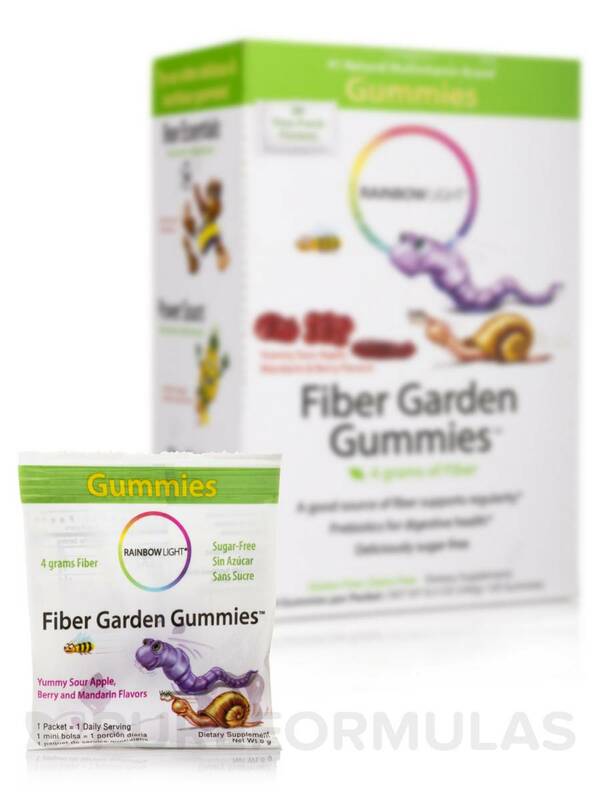 Fiber Garden Gummies™ are 100% natural and free of artificial colors‚ flavors‚ sweeteners‚ preservatives or additives. They also contain no lactose‚ nuts or yeast‚ and thus are safe for those with allergen sensitivities. Great for both kids and adults! 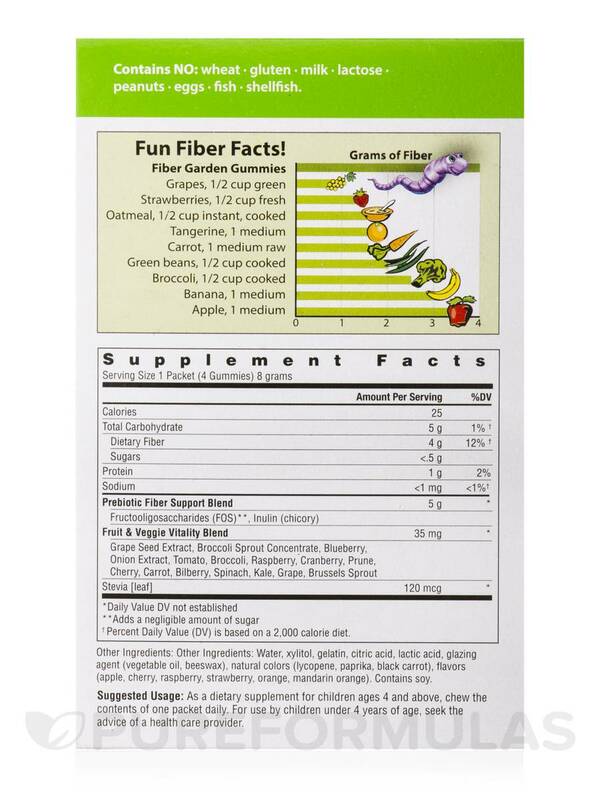 - A good source of fiber supports regularity. 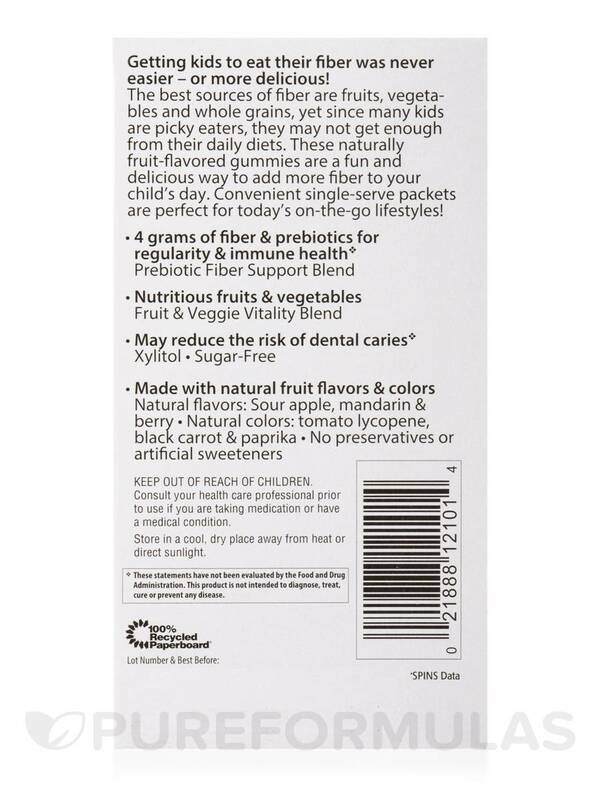 - Prebiotics for digestive health. Grape seed extract‚ broccoli sprout concentrate‚ blueberry‚ onion extract‚ tomato‚ broccoli‚ raspberry‚ cranberry‚ prune‚ cherry‚ carrot‚ bilberry‚ spinach‚ kale‚ grape‚ brussels sprout. **Adds a negligible amount of sugar. †Percent Daily Value (DV) is based on a 2‚000 calorie diet. Other Ingredients: Water‚ xylitol‚ gelatin‚ citric acid‚ lactic acid‚ glazing agent (vegetable oil‚ beeswax)‚ natural colors (lycopene‚ paprika‚ black carrot)‚ flavors (apple‚ cherry‚ raspberry‚ strawberry‚ orange‚ mandarin orange). Contains no wheat‚ gluten‚ milk‚ lactose‚ peanuts‚ eggs‚ fish‚ shellfish. 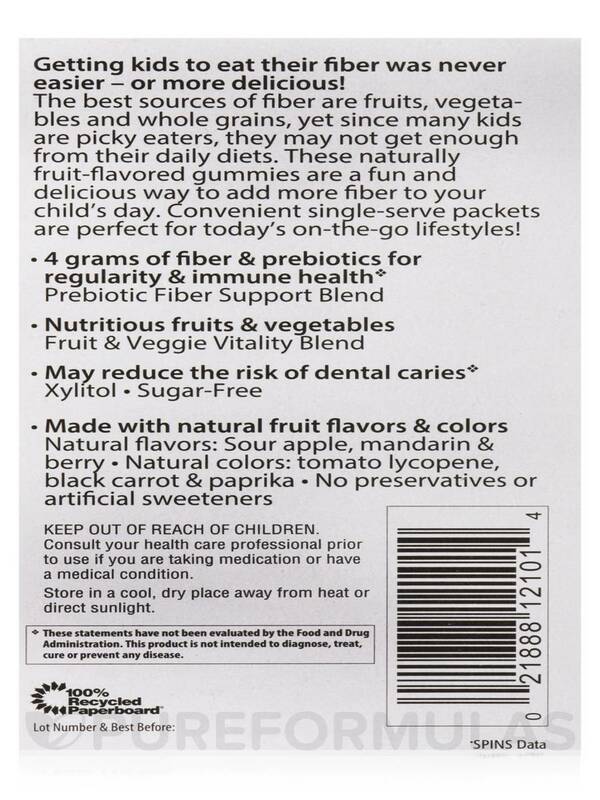 As a dietary supplement for children ages 4 and above‚ chew the contents of one packet daily. For use by children under 4 years of age‚ seek the advice of a healthcare provider. Keep out of reach of children. Consult your healthcare professional prior to use if you are taking medication or have a medical condition. Store in a cool‚ dry place away from heat or direct sunlight. 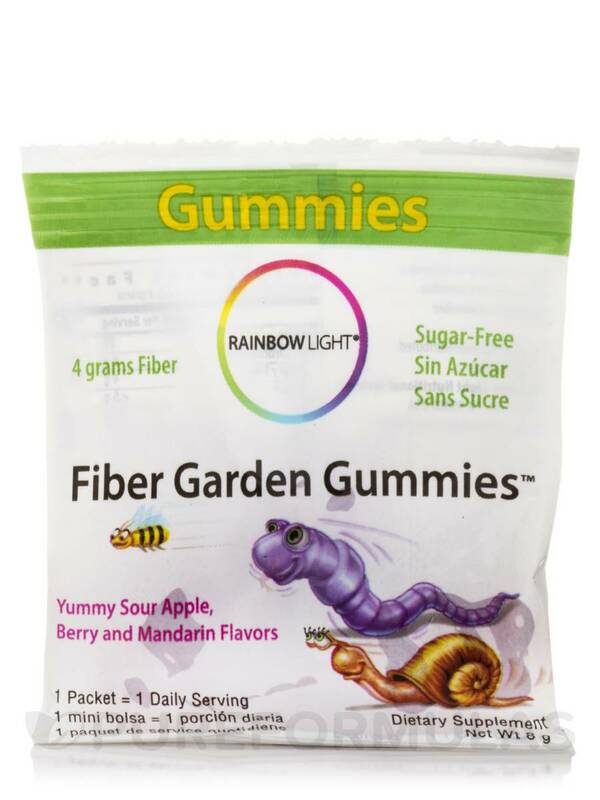 My son loves the taste of these Fiber Garden Gummies by Rainbow Light. I like that these keep him regular and the ingredients are simple. I've tried a few other kids fiber gummies before and was not successful on keeping him regular. So glad I found these. I can't order more than two packages at a time.